Happy Groundhog Day! And yes, I know that’s a cute little chipmunk and not a groundhog in my header! Hoping the groundhog will tell us that the polar vortex can move on – I have felt so bad for those of you suffering in the frigid weather that most of the northern hemisphere has been experiencing! Brrr! I got another little taste of winter myself last weekend. It was snowing when I landed in Denver and snowing when I left, and in between there was plenty of snow on the ground. I was warm and cozy inside the fabulous Southpaw Retreat, enjoying my fourth p2P LIVE event there, and I didn’t have to drive at all or even leave the building (once we got there). Many thanks to Sheri and Bob Wernke, the hosts who make this p2P LIVE event possible and who fed us and kept us warm and comfy. Thanks also to the attendees, many of whom were there for their fourth time, too. We had lots of fun and hopefully everyone learned a lot, too! I loved catching up with the ‘old-timers’ and meeting new peeps, too, and I missed some of the usuals who couldn’t make it this year. I love being able to do p2P LIVE events – it’s always fun to put faces to names of people whose pages I’ve seen, and getting to meet fellow digital scrapbookers is a plus. Another advantage to training at live events is that I get to see how other people work. I never cease to be amazed at the number of p2P LIVE attendees who bring HUGE monitors with them, and most use them in addition to their laptop screens. As someone who has never worked with two screens, and who typically sits on the couch with my laptop in my lap, it’s a whole new world for me! I’m always surprised to see how many people work with the Print Guide on all the time (you’re missing some helpful tips when using Blueprints, but you will want to use that Print Guide before you click the order button! ), how many who don’t use ‘All’ view or ‘Spreads’, and how many who don’t expand their elements panels (see link to tip below for help with any of these). It’s also a great reminder for me that while I may use Artisan almost every day, many people only get to scrap on rare occasions, like at retreats or crops. Ditto for using the p2P website and Facebook. I’m there every day, but most people don’t have jobs that pay them to use p2P and Facebook! I think it’s safe to say that I learn as much at p2P LIVE events as the attendees do. One of the challenges at a p2P LIVE event can be trying to meet each person where they are, without boring advanced users or overwhelming novice users, and this particular group was no exception. We had one brand new Artisan user, one just coming back after a five or six year hiatus, a few that only get a chance to scrap at retreats, some fairly consistent users, and some seasoned/advanced users. Thankfully, our p2P LIVE modules are designed to have a little something for everyone! Have a look at the gorgeous pages that were created by the talented Southpaw scrappers by clicking HERE. If you’ve never experienced a p2P LIVE event, I encourage you to look for one in your area (there’s a list in every Rabbit, Rabbit post) or contact us about hosting an event of your own. Tameka, Kim, and I love getting out in the field to see our peeps and share the digi love! Most events take place over a weekend, usually at a hotel or retreat center. The host/coordinator makes arrangements for meals, lodging, crop room, and AV considerations, and she sets the price and makes arrangements with the p2P team. Training costs (paid to Forever) are $500 for a Friday to Sunday event and $750 for a Thursday to Sunday event, plus food, lodging, and transportation for the trainer. The training, exclusive to p2P LIVE events, includes a Blueprint/Bright Idea combination and three to four training modules, chosen by the coordinator with input from the trainer. Of course, you have a Pixie on duty for most of the weekend, too, so lots of questions get answered along the way. We also review the p2P website, our Facebook groups, our Forever albums, and more. Many of our events are repeat events, so if you’re interested, send us a message or an email. We’d love to come to your place! If you’ve been to a p2P LIVE event, please comment below with your impressions, especially if you experienced any ‘AHA’ moments. And of course, we always want to improve our events, so if you have suggestions, we are open to hearing those, too. If you haven’t been to a p2P LIVE event yet, we hope to see you very soon! Artisan 5 Tip: Put the Work Area to Work! I attended a p2P event, in Fort Worth, last summer. Mary was the training Pixie. It was such a MOST positive experience. Of course meeting Mary and gaining more education from her was the best, but also meeting the other gals attending. The greatest lesson I learned from the event, was using a second screen!!! I left Fort Worth, drove straight to Best Buy in Corpus Christi (my home) and bought a TV to use! Lasting friendships have developed from this event have blessed me. I look forward to attending another event this year. I think this year, I’m going to plan for AL in June. And Jan, I haven’t given up on the idea of trying to put together an event here in Corpus Christi! When I put the info. out there late last year, just didn’t get quite enough interest, but I’ll be in touch soon to see when we might can shoot for it again! I had a wonderful p2PLIve weekend in Chester, CT! Tameka was so helpful, patient, a fountain of great tips and of course fun to listen to. I especially liked learning about the different options for changing color. The Break Outs were fun, amazing, challenging and definitely something I will try again. And while I’ve used Artisan for many years (off and on), the basics tutorial was really for everyone. There are so many ways to do one thing with computers, it was a great refresher and reminder of all the great techniques Artisan has to offer. 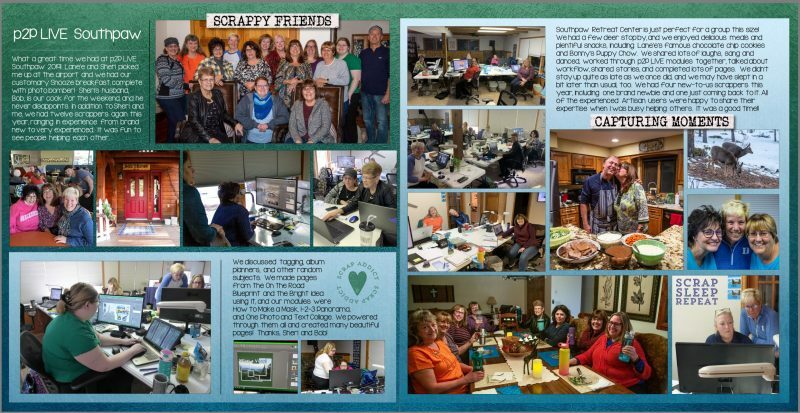 It was fun getting to know other scrapbookers from around our area, their pages are beautiful and something I aspire too. I’m so glad our host, Tammy Kirby, has decided to host another p2PLive event in October. Count me in! And come join us, you’ll be glad you did. Glad you enjoyed your weekend, Liesl! Meka is a fantastic trainer! Jan! I LOVE your page of our weekend! Did you put that in our random pages from the weekend Forever album? I would love to put it in my album, if you don’t mind!!! Great pages! Like all comments on this post, I, too, cannot emphasize enough how much fun it is to attend a p2P LIVE event, especially at such a cozy place in the woods of Bailey, CO, at Southpaw Retreat! It’s got everything you could possibly need and the breakout modules always teach new techniques. A great “aha” moment was seeing how Jan uses her notepad feature on her laptop to record exactly what kits she is using at the moment she uses them and how you can use them online, on your page or in social media. It’s a “game changer!” for me. But the “piece de résistance” just HAD to be the One Picture Collage page breakout that is so feature and technique rich! I grooved on that one to be sure! My only thing I would say for next year is you need to BRING MEKA with you!!! What a kick to have you both there together! Kim, you’re welcome, too! Thanks, Lane’e! I will upload those pages now – good idea! You know I love coming to Southpaw – thanks for having me again (and again!). Love those aha moments! I’m a newbie to p2P, Artisan and digital scrapbooking and I am registered for the Live Event in Helen (Atlanta), Georgia in March. Reading your blog post and these comments is getting me SO excited to attend! Fantastic! Welcome to a fun and productive group! You’ll love p2P LIVE! I am so beyond excited about the p2P Live event in Tampa next week! I, like Ruth above, have attended so many events where I was the only one doing digital. It will be really fun to be with a bunch of like-minded new friends! You will have a great time with Meka and all of the Florida girls! Enjoy! I LOVE p2P live events! I’ve attended two on Mackinac Island, MI, and going to my third in Tampa, FL, next week. Trainers in Mackinac were Jan and Tameka (and professional photographer Justine Forrest), and Tameka is our trainer in Tampa. First, it is heavenly to gather with like-minded digi scrappers for a weekend. Second, Jan and Tameka are fabulous trainers (I haven’t had any others). They are absolutey the most patient people on the planet, and not only are they great trainers, but they are also fun and have positive attitudes. I always learn many new things to add to my tool arsenal that adds variety to my pages. Without live training, I would not try some of the fun techniques and try to move away from the tried and true pages I normally create. I highly recommend attending a live event. They are great fun and productive. Well worth the cost! Thanks, Linda!! Mackinac was so much fun, wasn’t it? Juzzi and I loved our trip across America that year! I agree with you about being in the company of others who love what you love as well! And we learn so much from others as well—even during conversations at meals. So very true! We never know when something said or shown is going to ‘land’. You have to be in the right place to hear it or use it sometimes. I love going to Southpaw and was so thrilled that I could make the p2PLive event. Having everyone working on digital was awesome. Often I go to retreats where my friends are all doing traditional and I’m the lone digital scrapper. I have been a p2P member for about 5-6 years but let me tell you having Jan right there to answer questions and teach new techniques was beyond great. If you ever have the opportunity to go to a live event jump at it. Thank you Jan and Sheri and Bob for that oppotunity. It was so great to meet you in person, Ruth, and thanks for your kind words! See you next year!! Loved looking at all the pages and ideas. Thank you for sharing! They did great work, didn’t they? Thanks!